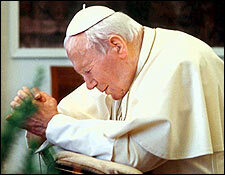 One Day John Paul II returned ill from the hospital and his attendants were told he was to stay in bed for several days. In the morning they came to his room and found him missing — he was not in his bed. And this is the kind of thing that made John Paul the Great a Saint.